Today, National Textile Corporation Limited (NTC Ltd) became the 51st Public Sector Undertaking (PSU) and 49th Central PSU to sign a Memorandum of Understanding (MoU) with Transparency International India (TII) for adopting Integrity Pact (IP). 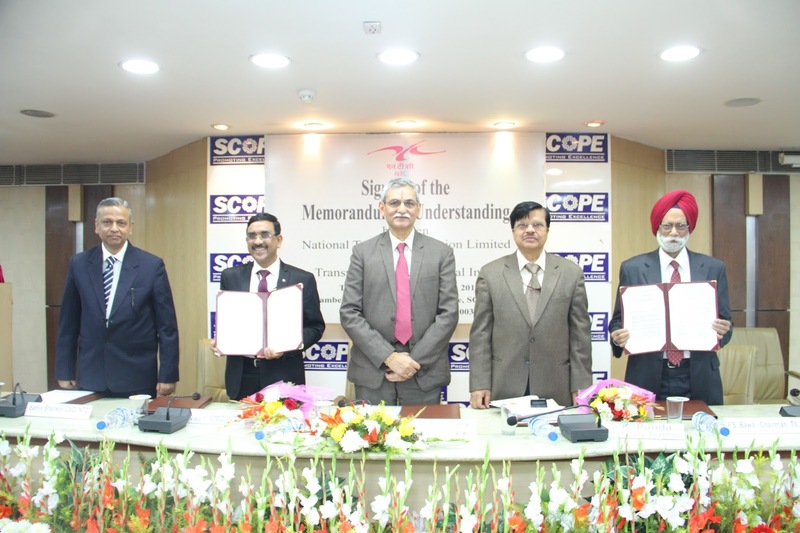 The signing ceremony was attended by Shri K V Chowdary, Central Vigilance Commissioner; Dr. S. K Panda, Secretary, Textiles, and other senior officials from Ministry of Textiles. Integrity Pact is a tool which ensures that all activities and transactions between a Company or Government Department and their Suppliers are handled in a fair, transparent and corruption-free manner. It prohibits any kind of bribing, favour or any other unethical practice, which is closely monitored by honorary Independent External Monitors (IEMs). Addressing the gathering, Shri K V Chowdary, Central Vigilance Commissioner said that Independent External Monitors (IEMs) should not be seen as umpires but as guidance providers. IEMs are there to throw light on the issues faced by vendors and advise the management regarding the same. He further added that any vendor who has a genuine grievance can approach the IEM. Observing that the signing of the MoU was a momentous step for NTC, Shri Chowdary said that the adoption of the Integrity Pact will formalize the various measures being undertaken by NTC to bring in fairness and transparency. Dr. S. K. Panda, Secretary, Textiles said that vigilance is important for the health of any organization, more so in the public sector, since public money is involved. He said that one should follow rules and guidelines, and that where any deviation is made in organizational interest, the rationale for such deviation should be recorded in writing. He also highlighted the need for building strong systems, especially by the use of technology. Shri P C Vaish, Chairman and Managing Director, NTC Ltd signed the MoU on behalf of their organization and Shri P S Bawa, Chairman, Transparency International India signed on behalf of TII. With the approval of Central Vigilance Commission, Shri Kalyan Chand, Ex Director General, Taxes and Shri Ashok Kumar Tripathi, Ex-Member, Company Board have been appointed Independent External Monitors to oversee the implementation of Integrity Pact at NTC Ltd.
NTC Ltd desires to implement Integrity Pact in over 95% of contracts. The Integrity Pact was prepared as per the guidelines laid down by the Central Vigilance Commission. Shri Vaish said that NTC Ltd has been a transparent and fair organization and signing the Integrity Pact will give rejuvenated strength to the organization. In 2006, ONGC was the first Public Sector Undertaking (PSU) to sign MoU with TII and implement Integrity Pact in its public procurement processes. Within a decade of Integrity Pact implementation in India, 48 major central PSUs have already become a part of the pact. Some of the leading PSUs that have signed the pact are SAIL, Indian Oil Ltd, Oil India Ltd, GAIL, Western Coalfields, Power Grid Corporation of India Limited and Pawan Hans Helicopters. Orissa Power Generation Corporation Limited is the only state PSU and New Delhi Municipal Corporation (NDMC) is the only municipality to sign a MoU with TII for implementation of Integrity Pact. NTC Ltd. is a Schedule-A Public Sector Undertaking engaged and entrusted with Management and operation of Sick Textile Undertakings taken over and nationalized through various Acts. From a sick corporation NTC Ltd has moved to a turnover of Rs. 12 billion in the year 2013-14 and operation loss to Zero. Transparency International India (TII) is an accredited chapter of Transparency International, Berlin. TII has been working in the field of public procurement since 2005 with an aim to bring about transparency in the tendering process. In the past decade TII has worked with various stakeholders namely the government, public sector undertaking, bureaucrats, media, academia and civil society in the quest of furthering the transparent procurement agenda. ‘Integrity Pact’, a Transparency International conceptualized instrument, has been vital in promoting clean procurement.